When it comes to CBD e-liquid, things like quality and potency are as important as price and long-term value for money. For people who are uninformed but keen to try vaping CBD e-liquid, the whole affair can get really expensive really quickly. There are the mod and the battery and the e-liquid tank. Then there’s the e-liquid or vape juice itself as well as the CBD additive and that’s not even to mention different flavors and huge disparities in price between different CBD e-liquids. The overlap between vaping e-liquid and vaping CBD Extract was something that was always going to collide in some way, although that has been a positive collision for the most part. The issues come in when people lack the knowledge necessary to make the right decision to choose the right CBD e-liquid for them. Factors such as consistency, potency, safety and of course, value for money are all at play in an industry which is currently just at its inception and taking baby steps towards the future. Many people around the world have taken the brave step of replacing their cigarettes with e-cigarettes and that transition has saved many lives and a lot of hospital bills. There’s no question, according to the research at hand, that vaping is much healthier than smoking even if nicotine is in the mix at high levels, as almost all of the dangerous carcinogens and toxic chemicals inside tobacco are not present when it comes to vaping. Then, there are those who have also turned to CBD to assist them with a good night’s sleep or to get some fast pain-relief. The fact that CBD is delivered well to the system via vaping, it was natural that it would be put together with e-liquid to offer the ultimate experience. But you need to know exactly what the information on the bottle means before you make a purchase, to ensure you are getting the best-quality CBD e-liquid which is made according to the safest industry standards. Is the CBD e-liquid you’re interested in cloudy or clear? What is better and how is it supposed to look? The highest-quality, purest e-liquids on the market are completely clear and you should be able to see light through the liquid without too much effort. Second-rate CBD e-liquids can be cloudy looking, syrupy and can often smell a little different. You’ll also want to check the label thoroughly to see what the ingredients are in the bottle and to ensure they are mostly natural and without too many chemicals in the mix. Next, you’ll need to check the CBD content to ensure you’re getting value for money as the price is mainly based on the per milligram CBD inside the product. As a final precaution, it’s always worth having a gander at the third-party lab results relating to the CBD e-liquid you intend to purchase. Any company worth their salt will have those reports readily available for customers in a transparent way. If a company doesn’t offer third-party testing results you are best to steer clear. Another vital issue to consider when purchasing CBD e-liquid is whether to opt for the disposable pre-filled cartridge option or to go for a cheaper but highly effective alternative. When you buy pre-filled CBD cartridges you have no control over the CBD intake you are getting with any degree of certainty. When you buy your own CBD e-liquid mixed with vape juice, you can control precisely the amount of CBD you put in the e-liquid, or indeed just buy different CBD Concentrations in handy little bottles so can choose how much CBD you are getting at any given time. There’s no question that buying CBD e-liquid is a far cheaper option – both in the short and long-term – than using disposable cartridges and that’s why we are proud to present two of the most popular, finest-quality and tastiest CBD e-liquids available on the market today, and you can get them at some great prices too. CBDfx Blue Raspberry e-liquid has a bunch of five-star reviews and is a product that is tried, tested and loved by many around the world. 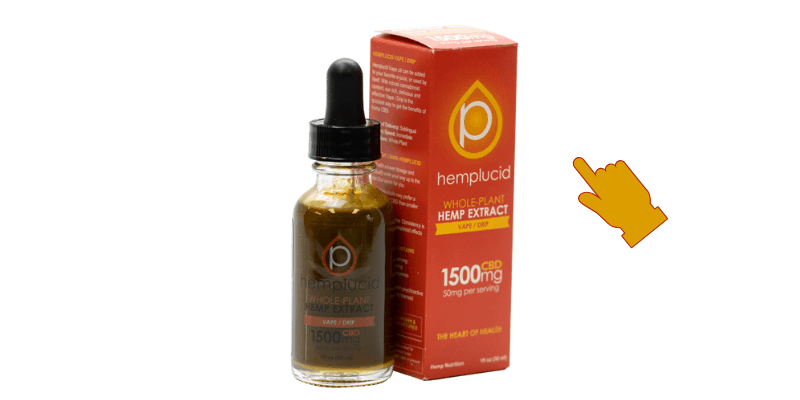 Whole Plant Extract Hemplucid e-liquid is also a great option and is another much-loved and trusted name in the world of CBD. Many people who want to get their ideal dose of CBD throughout the day through their vaping device come to CBDfx for their wide range of delicious, finest-quality CBD e-liquids. 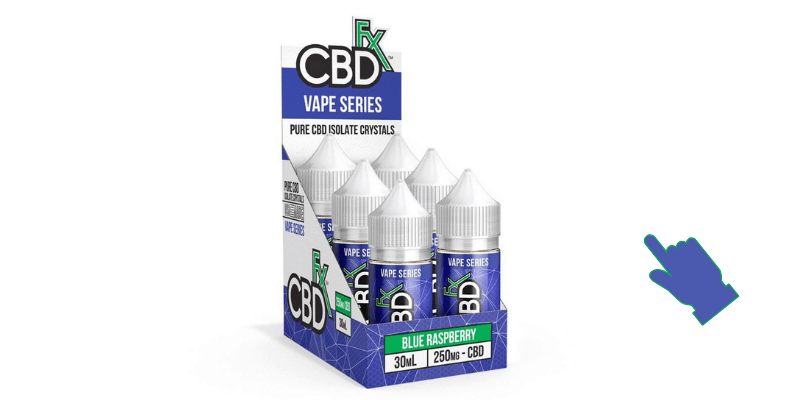 The CBDfx Blue Raspberry CBD e-liquid, for example, which is one of their most popular flavors, combines the best CBD extract together with hemp oil, vegetable glycerin, and other natural flavorings. Their dedicated flavor team works hard to ensure that CBDfx’s customers receive the most mouth-watering vape juices, using only the finest ingredients and best manufacturing procedures. One of the great things about vaping CBD is that you can control your daily intake and even switch it up depending on your needs at any given time. With CBDfx you also get a range of ten delicious flavors to choose from which makes the whole experience even more enjoyable and versatile. The whole CBDfx e-liquid range is designed specially to be compatible with sub-ohm vaping devices as well as the smaller vape pen style devices on the market. They also sell neat little bottles of CBD Oil Vape Additives which can be added to the mix to make the final result stronger if that’s what you want. But there’s a good reason why the CBDfx Blue Raspberry e-liquid is such a hit with so many people. This one is tart but sweet, reminiscent of childhood candies from back in the day. But don’t worry, it won’t turn your teeth blue or rot your teeth. Vaping this juice is like taking a walk down memory lane while getting just the right amount of top-shelf CBD Extract to keep you feeling great throughout the day. Each 30ml bottle is available in various strengths; from 250mg of CBD to 1000mg per bottle. These CBD e-liquids are carefully crafted in cGMP certified facilities and contain an optimized ration of PG/VG for that perfect hit each and every time. When it comes to the best quality CBD e-liquids, Hemplucid is a trusted and reputable name in the industry. The Hemplucid Vape/Drip, made from Whole Plant Extract, contains the finest CBD available on the market, expertly blended with the company’s proprietary formulation. They use only natural carrier oils for their potent CBD extract, which delivers a sweet and sharp flavor as well as some of the strongest effects out there. Hemplucid notes that vaporized CBD diffuses directly into the bloodstream – therefore bypassing the digestive system and delivering strong and immediate results to the user. Vaping CBD offers the highest bioavailability of any route of ingestion as well as the most rapid and direct absorption of CBD. However, one of the main reasons people choose Hemplucid’s Whole Plant Extract CBD e-liquid is because of the wide range of CBD Concentrations available. While some companies only offer three or four CBD Concentrate levels, with this product you get to choose from 5 different options. Beginners just getting into vaping CBD e-liquid may wish to go for the 150 or 300 mg concentration, while savvier or experienced CBD users can opt for 1000 and even 1500mg CBD Concentrations in their e-liquid. 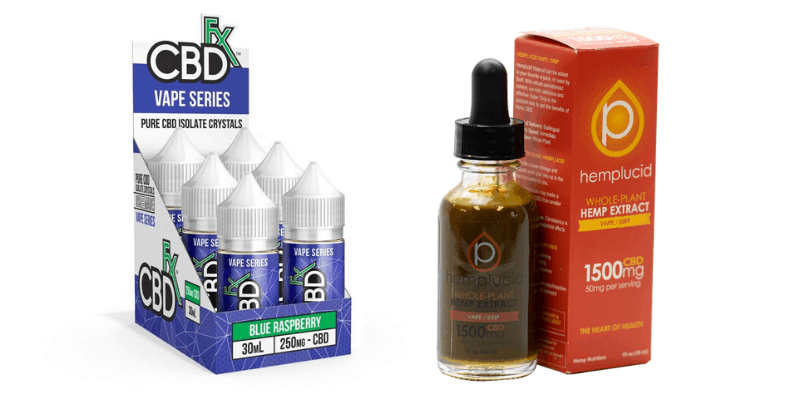 When you buy vape juice from Hemplucid, you can rest assured that you are getting some of the finest, most pure CBD available anywhere in the world, and their delivery times and customer service are also second-to-none. Vaping CBD e-liquid is considered to be one of the best and most effective ways of taking CBD. Once you have found a flavor that suits you, all you need to do is decide which CBD Concentration is the right one for you and you can make your purchase. Always ensure you check the label carefully in advance, and try to see some third-party lab results to ensure the products you are getting is ideal for your needs.